New, bold, sporty. It beckons towards new travel adventures. Its personality is tough, hardened and strong. Onboard comfort is thought through to the smallest detail. Reliability, power, safety – all this embodied by the new Arctic Commuter 35. Pardo 38. Write to info@pardoyachts.com for further info. On NauticExpo, the express cruiser is a boat between 9.5 and 15 meters long (31 to 50 feet) with a foredeck, one or more cabins and amenities such as a head, shower and galley. These launches offer overnight accommodations and are primarily intended for rapid cruising. 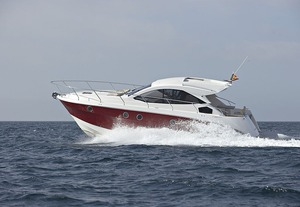 They also can be used for fishing, day trips and lounging at anchor, diving and even towed water sports. Those designed for inland waterways are particularly well-suited to the calm waters of rivers, lakes and canals. Such vessels are usually equipped with one or two inboard engines with shaft or stern-drive, though some use IPS, Zeus or hydrojet propulsion. Construction materials are a function of vessel size and lines, budget, local traditions and those of the boatyard. These include aluminum, steel, wood, fiberglass, carbon and other composites. Most of these launches are production boats, but some yards offer partial or complete customization possibilities. Equipment options are numerous. A sliding length cursor on the NauticExpo page will help in the selection of the right model.